Recently a mom wrote to me requesting that I add a few more pages to my free Book of Centuries download. I was shocked to realize that we end this decade this year! My, how time flies! Charlotte Mason encouraged her students to enter records, illustrate and write brief notes and mark dates of famous people, events, wars, eras, inventions and significant breakthroughs in their Book of Centuries once a week as they study. I wrote about my joy of using a Book of Century as a mother’s record of work and I still love browsing through my BOC and delight in the scope and richness of the education we have journeyed through these 19+ years. I added thumbnail prints of famous artists and masterpieces to my BoC from my Art Era Timeline. 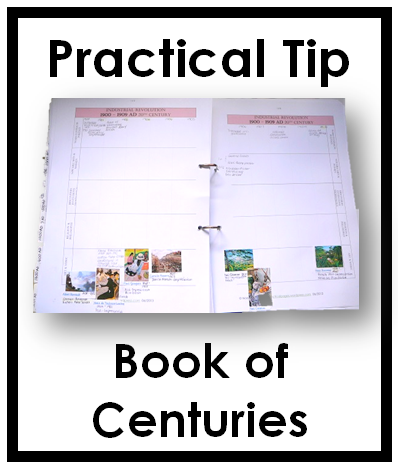 Practical Pages’ Frugal Timeline Book – a simple and cheap Book of Centuries made using an exercise book. Heart of the Matter.com How to Make a Timeline Easily with excellent details and instructions.